The Royal Winnipeg Ballet, Canada’s oldest ballet company, celebrated its 70th year by commissioning Jorden Morris to choreograph an original ballet. First performed in 2009, the ballet has since been filmed for showings in movie theatres. Moulin Rouge-The Ballet is directed by brothers Pierre & François Lamoureux of Cinemusica. The ballet is of course inspired by the Moulin Rouge cabaret in Paris. The cabaret is best known for the giant lit up red windmill outside and also as the birthplace of can-can dance.The Moulin Rouge has been a source of inspiration for numerous other fictional movies, documentaries and novels. As a ballet, the work done by the Royal Winnipeg is unique in that it is a film of a live performance. This is due to the company’s partnership with Cineplex entertainment, who screen the film in theatres all over the world. Morris’s story is one of love and passion. 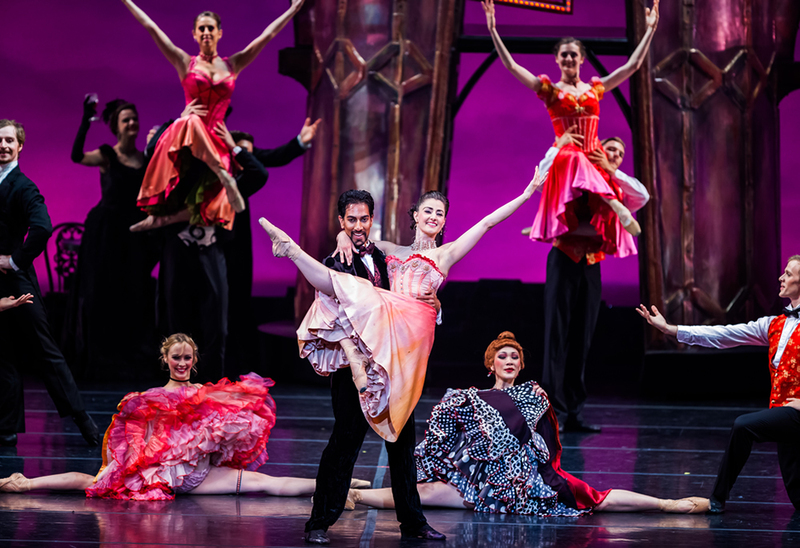 It features the unique can-can style, the sultry tango style but also highlights the Royal Winnipeg’s attention to technical ballet work. 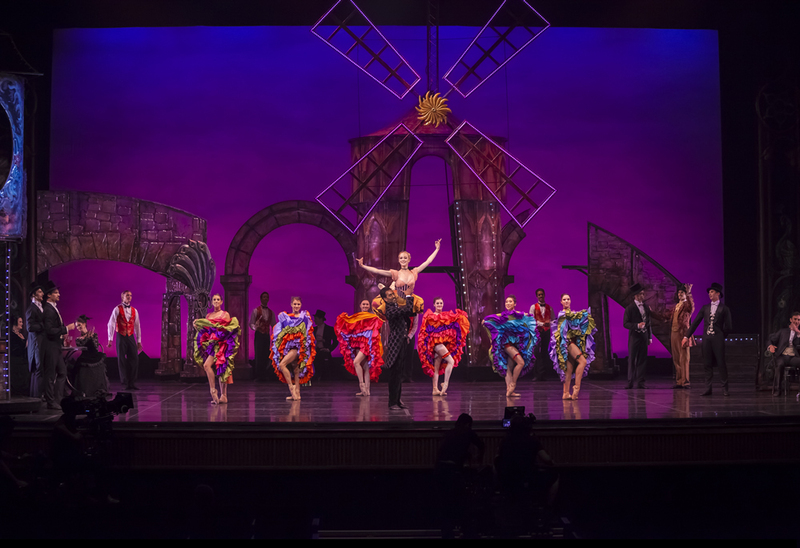 As if going to the theatre wasn’t easy enough, Moulin Rouge-The Ballet makes headway in turning ballet accessible by including melodrama and multiple captivating dance styles. The dancers portray the emotions so dramatically throughout the film that even the untrained eye can conceive the story. The filming and editing, however, is so precise that the trained eye can see the technical prowess of the Royal Winnipeg Ballet. Like the flipping of the girls’ skirts in the can-can, the audience is enticed for more as the dancers act across the stage. The ballet is set in the 1890s and tells a fictional theatrical love story, somewhat like the movie Moulin Rouge! directed by Baz Luhrmann in 2000. Nathalie (Amanda Green), a launderette gets work as a can-can dancer at the Moulin Rouge when she falls madly in love with Mathieu (Christian Clark), a young painter. They run away together but Nathalie’s boss Zidler (Amar Dhaliwal) gets jealous and the men fight over her, Natalie is eventually shot by her boss. Many different scenes and styles are used to convey this story. 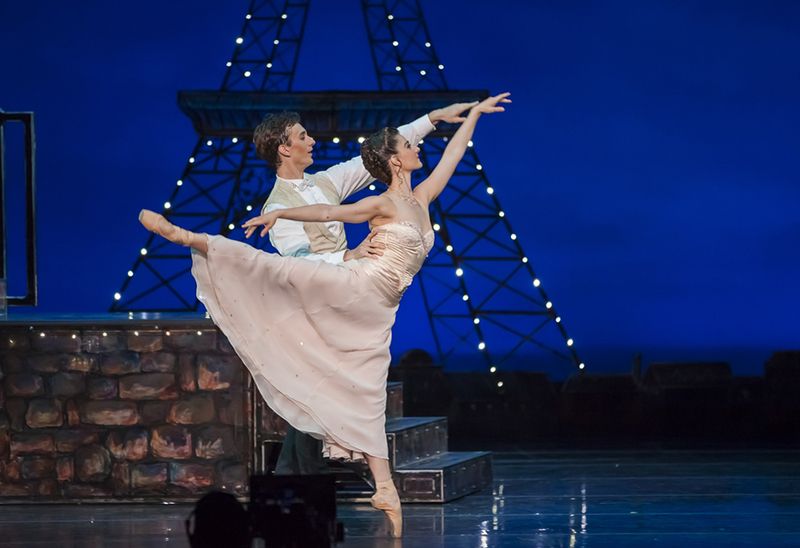 The opening of the ballet is a character study; the main characters walk across the stage informally, acting out their characters’ personality traits. When it is time for Nathalie and the other female launderette dancers to audition for the Moulin Rouge they strip down to their petticoats and get their pointe shoes on. When Nathalie and Mathieu run away they find themselves receiving tango lessons where again the style switches again, the ladies are in heels and it is a formal tango/ballet mix. The footwear is an example of how detail oriented the ballet is. Each dance style or genre has its own specific dress; the detail is so precise for example that the cabaret dancers had bills tucked in their garter belts. What makes this performance unique is that it is a filmed live performance. This gives the film-viewing audience shots one would never see as a live theatre audience. The directors are careful though to make sure the dancers’ performance doesn’t get lost in jump cuts or over-editing. Often, if you buy cheap seats, you end up not being able to see a third of the stage because of the horrible angle from which you are viewing the show. The nice thing about a movie theater is that there are no bad seats, apart from the neck strainers; you are always able to see the whole screen because it is two-dimensional. However, the directors’ careful editing with multiple camera angles makes it feel as though it was 3D. They are even able to offer views one would never get from a seat in a theatre like the overhead shot. Getting a bird’s eye view of fouettes and the multiple turning lifts is absolutely spectacular. The zooming in and out also shows just how deep the stage is. When you see a live show, a deep stage can mean the performers get lost in the back but with cameras all over the stage they could edit shots of the background spliced into the wide and close-up shots of the leads. The love story is melodramatic and this theme carries over into the moves, expressions, costuming and lighting. All aspects of the film are over the top but all of them are so detailed, obviously someone knows how to write a good grant because the production value is amazing! The costumes, the layers of costumes, and the amount of rolling sets are unbelievable for a live performance. In seconds the stage transforms from wide shots of the Moulin Rouge in the distance, to the interior of the cabaret, to just outside the doors, beside the turning, red, lit up windmill. The dancers spend equal time dancing as they do acting, which helps take the audience on an emotional rollercoaster. All it needs is some lyrics and the ballet could be a musical, these dancers played their roles really well. The dancing is of course amazing ballet dancing. The can-can looks lovely en pointe but maybe too much time is spent on the ballet style for a piece that is trying to push multiple styles. More time could definitely be spent on the tango. One thing I did notice is that against typical ballet style, the men get quite a few chances to perform while the women wait in the backdrop. I would estimate that it is a 70/30 split for the women which may not seem like a lot but many classical ballets barely let the men dance solo period. What am I saying is of course this is an incredible work; it wouldn’t have been seen by 110,000 people if it weren’t. It pushes classical ballet in all the right ways. It ruffles feathers, it is a little scandalous but that’s not what is noticeable. What is noticeable is the amazing theatrical and dance facility of the performers and the attention to detail paid by the people who make it a brilliant film.